Who invented Soap? The original invention of Soap is so old that the name of the inventor has been lost over time, although the first use of Soap is believed to have originated in the Babylonia, one of the civilizations who inhabited the lands of Mesopotamia. When was Soap invented? Historians tend to agree that Soap was invented c. 2200 BC and the first known use of Soap was during the Ancient World (4000 BC - 600BC) of invention. Evidence to support this is that a formula for soap, consisting of water, ashes of the saltwort (an alkali) and cassia oil, was written on a Babylonian clay tablet in "Cuneiform", the first form of writing. Fats boiled with ashes was a traditional soap-making method used for over two thousand years. 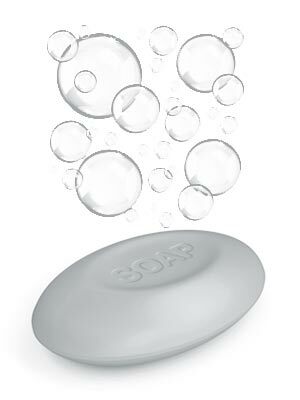 Definition of Soap: Soap is defined as a cleansing substance used with water made from a compound of natural oils or fats with sodium hydroxide or another strong alkali with added perfume and coloring that is used for washing and cleaning. Fact 1: Who invented Soap? The name of the inventor of Soap is unknown but it is believed to have been invented in c. 2200 BC during the Ancient World (4000 BC - 600BC) era of inventions. Fact 2: Who invented Soap? Prior to the invention of Soap c. 2200 BC, washing was limited to using water alone. People bathed in rivers, lakes, the sea, springs and water holes - in fact anywhere where water was readily available. Fact 3: Who invented Soap? The origin of the word soap is not clear, but it is generally believed to have originated from the Latin word 'Sapo'. Fact 3: Who invented Soap? According to Roman legend the word 'Sapo' originated from Mount Sapo, an ancient site where animal sacrifices were made. Following an animal sacrifice, rain would wash away the ash of burnt offerings and animal fat down to the banks of the Tiber River. Fact 3: Who invented Soap? The ancient legend tells that Roman women who washed clothes in the Tiber River noticed that water contaminated with animal fat and ash produced much cleaner clothes - hence the word 'sapo' and its derivative 'soap'. This Roman legend does not ring true - Mount Sapo was a purely fictional mountain and the Romans did not burn the edible flesh of animals that had been sacrificed, only the inedible bones and entrails were sacrificed as burnt offerings to the gods. Fact 4: Who invented Soap? The more likely etymology of the word 'sapo' is that it was borrowed from the Gauls meaning "fat" or "tallow" as in animal oils" - The Romans used oils to cleanse themselves, hence the word 'sapo' and then the word soap. Fact 5: Who invented Soap? The Mesopotamians did practise animal sacrifice and made burnt offerings to their gods. It is therefore possible that they, and not the Romans, discovered that water contaminated with animal fat and ash produced much cleaner clothes. We know that their formula for soap, consisted of water, ashes of the saltwort (an alkali) and cassia oil. The saltwort plant is an important source of soda ash, an alkali substance that is crucial in soap making. The use of aromatic cassia oil as a constituent of soap had many added medicinal benefits. Cypress oil and sesame seed oil was also known to be used in recipes for Mesopotamian soap. Fact 6: Who invented Soap? The ancient Mesopotamians had very skilled physicians who realized that washing a wound with clean water, and making sure the hands of the doctor were also clean, prevented infection and hastened healing. Wounds and hands were therefore cleaned with a mixture of alcohol, oil and hot water that was used as an early form of a liquid antibacterial soap. Fact 7: Who invented Soap? The Phoenicians an ancient Semetic seafaring culture were in close contact with the civilizations of Northern Mesopotamia, the original home of the Hebrews, and frequently copied their ideas. The Phoenicians developed their own soap c.600 BC using goats tallow and alkaline salts mixed with water. Fact 8: Who invented Soap? The ancient Egyptians also had very skilled physicians. An ancient Egyptian medical document called the Ebers Papyrus that was written c. 1550 BC describes the use of a combination of animal and vegetable oils with alkaline salts to form a soap-like material used for washing and treating skin diseases. Fact 9: Who invented Soap? The ancient Chinese from the Zhou Dynasty (c. 700–221 BC) used plant ash mixed with crushed seashells to produce an alkaline chemical that could remove the stains of light-colored silk fabrics. Fact 10: Who invented Soap? Wealthy Romans were fastidious in their cleansing routines. Olive oil was rubbed into the body and a strigil, a curved blade with a handle, was used to scrape off the oil together with the dirt. They then visited the Roman baths (thermae) for a hot and cold bath. Fact 11: Who invented Soap? The ancient Romans did use a form of soap as an ointment to treat skin diseases, an idea they no doubt took from the Egyptians. The Romans used urine (ammonia) to wash clothes by removing grease and dirt from fabrics. Fact 12: Who invented Soap? The Gauls and the German tribes of the Dark Ages were known to make soap with animal fat, beech tree ashes and goat's milk which produced a creamy lather and contributed to moisturizing and improving the smoothness of skin. Fact 13: Who invented Soap? Many civilizations across the world used plants that contain Saponins to make soaps. Saponins are chemicals found in plants that possess soap-like qualities and produce a lather when mixed with water. Over 100 different types of plants make saponin which can be found in the leaves, the stem, the flowers, the roots and sometimes in the berries of plants. A soap is obtained by boiling different part of the plant in warm water. The leaves or roots of some plants were simply rubbed with water to produce a soapy lather. Fact 14: Who invented Soap? The Native American Indian tribes used Sweat Lodges for cleansing during special ceremonies but also as an everyday luxury. Buffalo fat was used as soap. They also used the roots of soaptree yucca (Yucca elata), which are high in saponins, and used as a shampoo for various Native American rituals. Fact 15: Who invented Soap? The Ancient Chinese of the Han Dynasty (206 B.C.–A.D. 220) discovered a naturally occurring form of saponin that could be extracted from the ashes of knotweed and wormwood. Fact 16: Who invented Soap? In 300AD Arabian civilisations made both solid and liquid soaps using aromatic and vegetable oils. The Arabian soap making process consisted of mixing sesame oil with a potash, alkali and lime and pouring the mixture in a mould to make bars of soap. Fact 17: Who invented Soap? During the 8th century, soap-making industries for washing clothes were established in France, Italy and Spain where soap was made with goats fat and the ashes of Beech trees. It was at this time that the French started using olive oil and adding fragrances to produce soap. Fact 19: Who invented Soap? By the Elizabethan Era Queen Elizabeth I made bathing acceptable to the rich by bathing once every month "Whether it was necessary or not" and the soap-making industries started to flourish in England. Fact 20: Who invented Soap? The Elizabethan period in history was the Golden Age of Exploration and colonization and several soap-makers were on the second ship from England to Jamestown in Virginia. The American colonists later invented a process to produce lye-soap by making lye from wood ashes and water. Fact 21: Who invented Soap? In the 16th century, three broad varieties of soap were available: coarse soap made from train oil (extracted from whale blubber), sweet soap from olive oil and speckled soap from tallow. Fact 22: Who invented Soap? The English soap-makers suffered a severe blow when speckled soap was banned because it depleted the country’s reserve of tallow trees, making candles too expensive for the poor. The British Soap Tax was passed in 1712, making bathing a luxury for rich people. Fact 23: Who invented Soap? In 1791, during the Industrial Revolution, the French chemist Nicholas Lablanc (6 December 1742 – 16 January 1806) discovered a process that used common salt to make sodium carbonate, or soda ash, the alkali obtained from ashes that combined with fat to form soap. Fact 24: Who invented Soap? In 1789, a Cornish barber called Andrew Pears established a premises in Soho, London that would lead to the launch of Pears purer and gentler and first translucent soap - the oldest brand in the world. Pears became part of Lever Brothers in 1915. Fact 25: Who invented Soap? In 1861 the Belgian chemist Ernest Solvay discovered a process to reduce costs even further. This process that created alkali soda from common salt led to the ability to make much cheaper soaps and a huge leap in commercial soap-making in England that had been boosted in 1853 when the Soap Tax had been revoked. Fact 26: Who invented Soap? In 1864 Caleb Johnson established the B.J. Johnson Soap Company in Milwaukee, United States producing a soap made entirely from palm and olive oils. In 1898, the company introduced the Palmolive brand, which became so successful that the company changed its name to Palmolive. The Palmolive company eventually merged with the Colgate Company in 1928. Fact 27: Who invented Soap? Camay the brand name of the famous scented hand and body soap, was first introduced in 1926 and made by Procter & Gamble. Fact 28: Who invented Soap? The brand Imperial Leather soaps are manufactured by PZ Cussons. In 1938 Alex Cussons used the original perfume and created Cussons Imperial Leather soaps and other toiletries. Fact 29: Who invented Soap? Who invented Dove soap? The American chemist and inventor Vincent Lamberti (1928 - 2014) was the inventor of Dove soap. Lever Brothers successfully marketed Dove soaps as being less irritating to the skin than traditional soaps. Fact 30: Who invented Soap? Who invented Antibacterial Soap? Antibacterial soap was patented on December 25, 1984 by the scientists Peter Divone and David Joshi. The patent for the 'process for manufacturing translucent antibacterial soap' was filed on June 8, 1987 and granted to David P. Joshi and Peter A. Divone, patent number 4762642. The Assignees of the Antibacterial Soap patent were the Colgate-Palmolive Company.